I think I may have to pick these fellas as my new favorite gingerbread cookie:) It all started when I saw a clothespin craft on Pinterest. Looking at these cookies I bet you can imagine what the painted clothespin looked like, right? Check out THIS POST from Eyeballs by Day, Crafts by Night, and you will see for yourself. And then there's Meaghan of The Decorated Cookie. She recently made some adorable snowmen cookie sticks, which finally got the ball rolling for my own cookie sticks. Check out Meaghan's tutorial while you're admiring the snowmen. I used the bench scraper to measure and cut my dough also, though my sticks were 4 1/2 inches, by 3/4-inch going into the oven. I used my favorite gingerbread cookie recipe to make these fun cookies! Roll the cookie dough out 3/8-inch thick, and into a rectangle. Using a bench scraper (or ruler), make a small notch at each 3/4-inch measurement across the top, then measure 4 1/2-inches from top to bottom, and mark that with a notch. Cut out the strips with the bench scraper and place them on the baking sheet. Place the baking sheet in the freezer for 10-15 minutes to help them keep their "stick" appearance. Bake according to recipe (linked above). Using a number 2 tip, outline the cookies with brown royal icing (I used a mix of AmeriColor chocolate brown and warm brown). Let dry. Using black, red and untinted royal icing, decorate the cookies as pictured. Let dry. 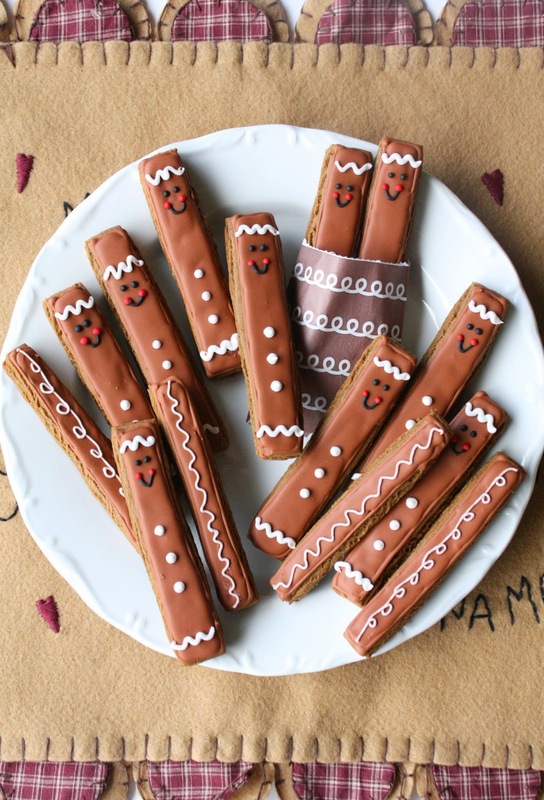 These fun cookie sticks would be great to stir in hot chocolate or as stocking stuffers! these are so darling!!! Love them! Awww, they are so cute. The design works perfectly on a stick cookie. oh my gosh! I can't ever stand it! Those are too cute to eat! You are so creative! These are the cutest cookie sticks EVER! Pinning now!!! Sue I am in love with these! I =gave out cookie sticks to my kids' teachers this year but they were nowhere nearly as cute as this!! These are so, so cute! I love that they are sticks. What a fun twist on a gingerbread cookie. I have been a reader for a long time, but am TERRIBLE about leaving comments. However these are SO adorable I had to say thanks for this super cute EASY idea, and all the others! 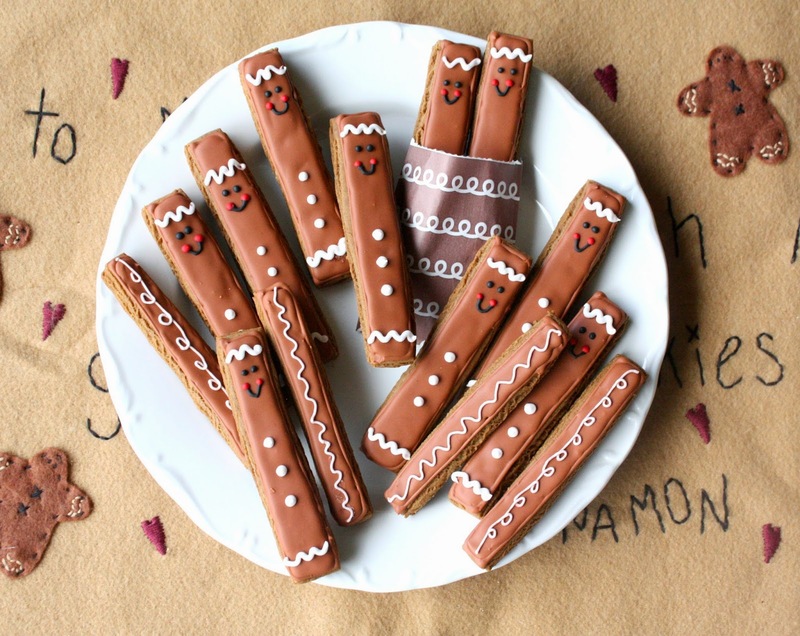 These cookie sticks look very yummy! Thanks for sharing. This recipe says to put the cookies in the freezer for 10 to 15 minutes is this before or after cooking? So then how long do they go in the oven for? And at what temperature? could you send me your gingerbread recipe i dont have a recipe. and they look so very cute. i decorate my house with gingerbread them for christmas. i need to do this. love it. There's a link to the recipe in this post under "Instructions", and other baking details are contained there also. i cant print with my computer so i will have to write it all out. unless you could pop it in the mail to me. that would be a special treat to receive. thank you so much. Am I missing something somewhere? I think the baking instructions were forgotten. I'm reading about placing them in the freezer for 10 to 15 minutes I'm assuming so they don't spread in the oven and the very next instruction is to let them cool completely. What happened to baking them at a specific temperature for a specific amount of time? Am I not following something? Did I miss it? These are so cute. Where did you get these little bags their in? basketpam, Right below the last photo, there is a link to the gingerbread cookie recipe from within my blog, then on this post I add specific instructions for these cookie sticks. :) Sorry for the delay! Anonymous, I really can't remember, but I think I got it at Layer Cake Shop. basketpam, I edited it further to include putting the unbaked cookies (on the baking sheet) into the freezer before baking and then again noted to bake cookies according to linked recipe. Sorry for the confusion! I'm as confused as basketpam. Neither the original recipe or the stick recipe address the "put them in the freezer" steps. Do you freeze them before or after baking? Dori, I just edited it further to include putting the unbaked cookies (on the baking sheet) into the freezer before baking and then again noted to bake according to linked recipe. Instructions are still on the post on how to prep the COOKIE STICKS before baking. Sorry for the confusion! Where do you find the bags?